How can I be a success on Betfair in Australia, what is the betting exchange advice. Successful trading on Betfair Australia. Betfair in Australia are a betting exchange to back and lay sports bets. What does greening up mean on Betfair. Being a layer on Betfair is just like being the bookie with the pitch at the end of the line in the betting ring. When the favourite is backed from 2/1 to 6/4 at the prime pitches, you will find that suddenly, the 9/4 you are offering is snapped up. So be warned and while you are not a conventional bookie, more a punter trying to back horses to lose, some maxims of conventional bookmaking still apply. The object of traditional bookmaking is to lay every horse at the shortest possible price, but in practice most on course layers aim to lay the first three in the betting to make a round losing book and hope for a "skinner" if an outsider comes in. Similarly, it is better to lay more than one in a race to offset your liabilities. It gives you a smaller downside and bigger possible upside. Laying short-priced favourites at slightly better odds can be a lucrative long-term exercise, especially if you are a good judge of a dodgy market leader. Likewise, laying 20/1 about a 16/1 shot can make what looks like easy money but of course the downside can occasionally be costly. Possibilities for backers are obvious. Consistently better prices than the prevailing live show, the ability to get on steamers at prices that have disappeared on course; the ability to tout for a better price if you can't win as a backer in an over-round free environment, you can win anywhere. Everyone wants to be able to identify winners, but there is also money to be made by being able to predict market movement, regardless of the result, just as you can on the stock exchange. If you know a horse is likely to drift, you can step in and lay the best price early and then see the horse you've laid drift to a bigger price than the one you've traded at, and then back it at the bigger price, and whatever the result you will, if you've done your sums correctly, make a small profit. This is sometimes called greening up, as all of the returns become positive and therefore green. Conversely, you can back a favourite at 7/4 if you know he's likely to shorten to evens so you can lay him at, say, 5/4 just before the off, again locking in a profit whatever the result. Look at the screen print below. 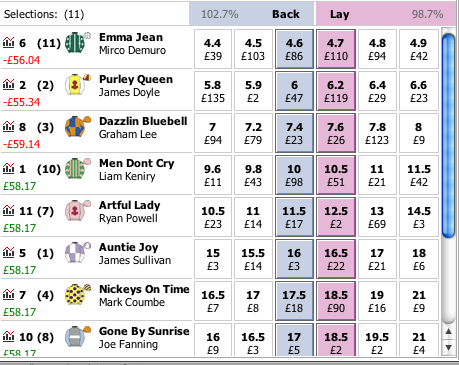 You can see the trades made on the right, and you will see that 3 horses have been backed at larger prices, and then layed at lower prices, result in the punter greening up. For instance Es Que Love was backed at 4.92 for £470 which would return £1,841 and then layed at the lower 4.77 for £470 which would mean only paying out £1,774.